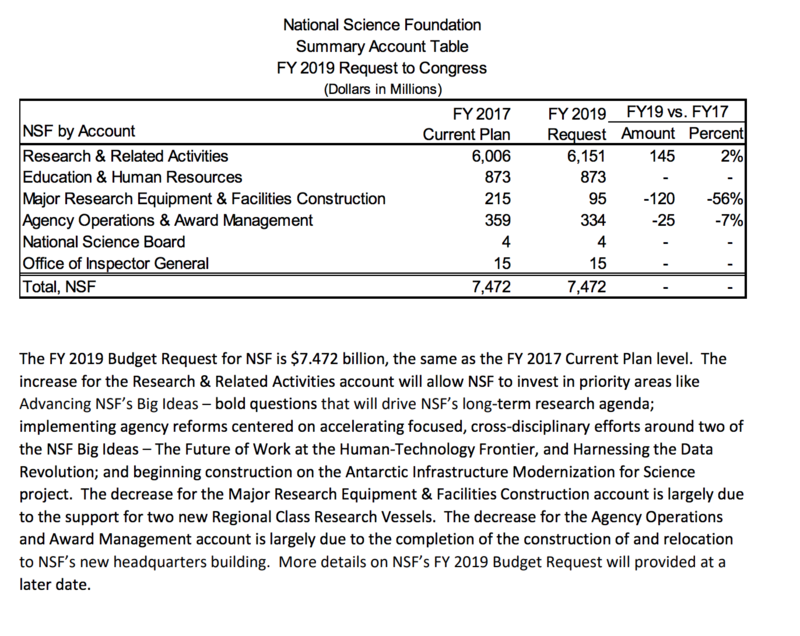 The President’s budget request for FY 2019, released yesterday, includes some modest gains and some big losses for Federal science agencies — details below, but on the whole a rather mixed bag for those who believe in the importance of the Federal investment in fundamental research. But it could have been much worse. We’d gotten warning that the budget would likely slash science investments at multiple agencies in fairly dramatic ways. But that was before Congress and the Administration managed to agree late last week — with only a brief government shutdown — on a two year budget deal that increased budget caps on both defense and non-defense discretionary spending. That agreement, reached early Friday morning, boosted the non-defense discretionary spending cap by 26 percent over the next two years, and sent the White House’s Office of Management and Budget back to the drawing board over the weekend, revamping the President’s planned request to reflect the new fiscal reality. But the budget agreement changed most of that. With new caps that made room for $132 billion in additional non-defense spending, President Trump and his OMB Director Mick Mulvaney made the decision to add just $75 billion back to the non-defense budget. In his transmittal letter to Congress, Mulvaney acknowledged that though the President agreed to the new budget caps by signing them into law, he didn’t believe that the increases were completely justified for non-defense spending, so his request effectively leaves $57 billion in potential spending on the table. Department of Defense Science and Technology: overall, up 2.3 percent over FY17; Basic Research (6.1) up 0.5 percent; Applied Research (6.2) down 4.4 percent; Advanced Technology Development (6.3) down 0.9 percent. DARPA is the big winner in DOD S&T with an increase of about 19 percent vs. FY17 in the President’s plan. National Institutes of Health: NIH was also slated for a substantial cut (27 percent) in Trump’s initial plans for FY 2019, but emerged from the weekend with a flat budget request vs. FY17. Department of Energy Office of Science: Slated to receive a 22 percent cut, instead would also get flat funding vs. FY17 in the President’s budget. Advanced Scientific Computing Research (ASCR) — primarily because exascale is a clear Administration priority, would see a 39 percent increase vs. FY17, growing to nearly $900 million. Department of Energy’s Advanced Research Projects Agency (ARPA-E): The President’s plan once again eliminates funding for the ~$300 million agency. The President’s FY 2018 budget called for the program’s elimination, but congressional appropriators are split on whether to follow through. House appropriators agree with the President’s request to close the office, Senate appropriators included $330 million for the agency in their FY18 appropriation. National Institute of Standards and Technology: NIST’s Science and Technical Research and Services (STRS) would see a 16 percent reduction vs. FY17 under the President’s plan. NIST’s Manufacturing Extensions Partnership would be eliminated under the budget. Climate Research: The President’s budget would eliminate climate research programs at EPA, support only 3 of 8 USGS Climate Science Centers, and cancel five NASA earth science missions. Of course, the President’s budget request is just the starting point in a year-long (or longer) process of appropriating funding for Federal agencies. Congress has the key role to play in actually putting numbers to these programs, and they’ve already demonstrated no serious commitment to budget suggestions from this Administration. Odds are also good that they’ll find ways to spend that extra $57 billion in non-defense spending the President didn’t see fit to include in his request. There are also many other details about this budget we’re still waiting to learn — how NSF plans to prioritize its research, what shifts in cyber security research funding at the Department of Homeland Security mean for the character of the work supported, how the Department of Energy expects to ramp up exascale funding…to name just a few. And, of course, we still don’t know how congressional appropriators plan to put that extra spending towards the unfinished FY 2018 appropriations, something they need to decide before March 23rd, when the current continuing resolution funding government expires. So while this is an important first step in science funding for FY19, it’s just the start of a long process. It would have been better to find more support from the President for the investments that help fuel the innovation that drives the nation’s economy and our competitiveness, but this is just the first word in the conversation and not the last. We’ll continue to weigh in with policymakers about the importance of the Federal investment in research. And we’ll track it all and report what we learn here, so stay tuned!